11th: Favourite Cuisine – Where does your favourite food come from? I spoke about how much I love Thai and Japanese food for MoFo last year, so I wanted to do something different this year. 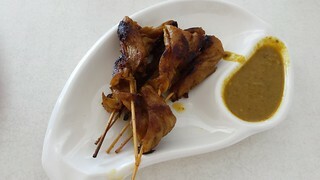 I like a lot of different food, but there is a particular style of a cuisine that I am in love with. Chinese food, yeah, it's fine. But yum cha? Oh my gosh, I love yum cha! Nothing makes me more excited. 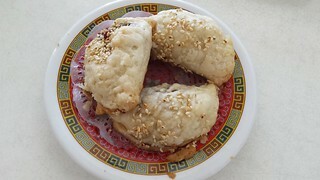 I've blogged about Easy House before, and how much I love going down for yum cha. 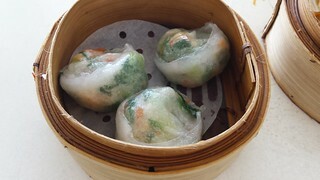 The beaches of the Gold Coast hold no attraction for me (fould evil burning day star magnified by sand and water), but yum cha is certainly a reason worth making the trip! In honour of Mofo, and also just because we love going to yum cha, I went down recently with my friend Amy. It was a bit weird when we got there. Even though they had been open for an hour, they didn't have anything ready yet, so we had to order off the menu. Will still ate the same things we would have if they had been bringing them around on trays, but it didn't have quite the same feel to the experience. Oh well, the food was still good! 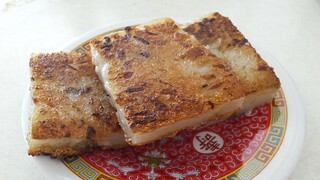 Pan-Fried Noodles in XO Sauce. The XO sauce normally just pushes my spice limit, but on this occasion it totally exceeded it. I sniffled through a little bit, thankfully Amy ate the rest. 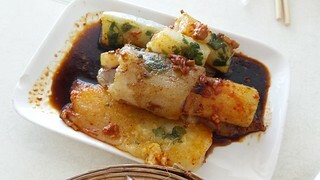 Steamed Bean Curd Rolls. My favourite! Chicken and Bok Choy Dumplings. 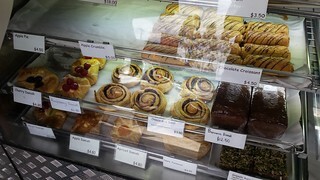 On our way back, we stopped off at Flour of Life Bakery, a new vegan bakery that has opened up at Helensvale. 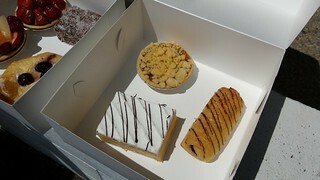 Here are some bonus photos of pastries! 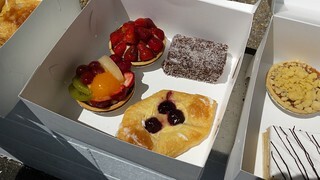 My favourites were the strawberry and fruit flans, the cherry danish and the chocolate croissant. The vanilla slice was good, but the icing was too sweet. The pastry on the apple tart was a bit smooshy, unfortunately. And the lamington was very dense and dry in texture. Do you yum cha? 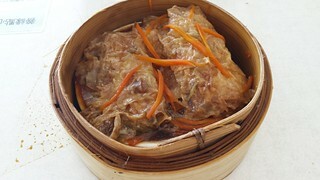 Or dim sum, as it is known elsewhere? 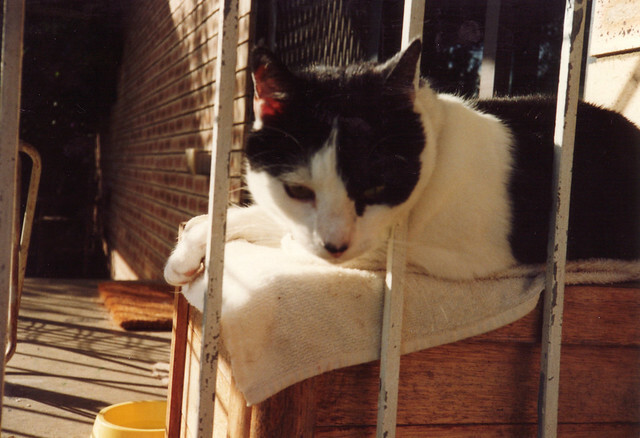 Handsome Patches, my third kitty, saying hello through the balcony. I've never actually been to a dim sum restaurant! It seems fun! It is so much fun! And so tasty. 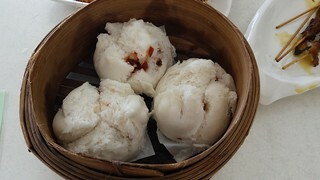 Oh, I love dim sum! That all looks fantastic. 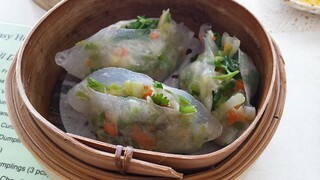 One of my favorite restaurants with terrific vegan options is going to start having dim sum on Sundays. Very exciting! What lovely restaurant. The food looks so good! All of the dumplings and buns. What a cute patchy kitty!!! The yum cha place has quite a few GF options as well, so you would be looked after there! "fould evil burning day star magnified by sand and water"
XD Yes, beaches are best for winter, spring, and fall, not summer. I at least assume this place is a beach.